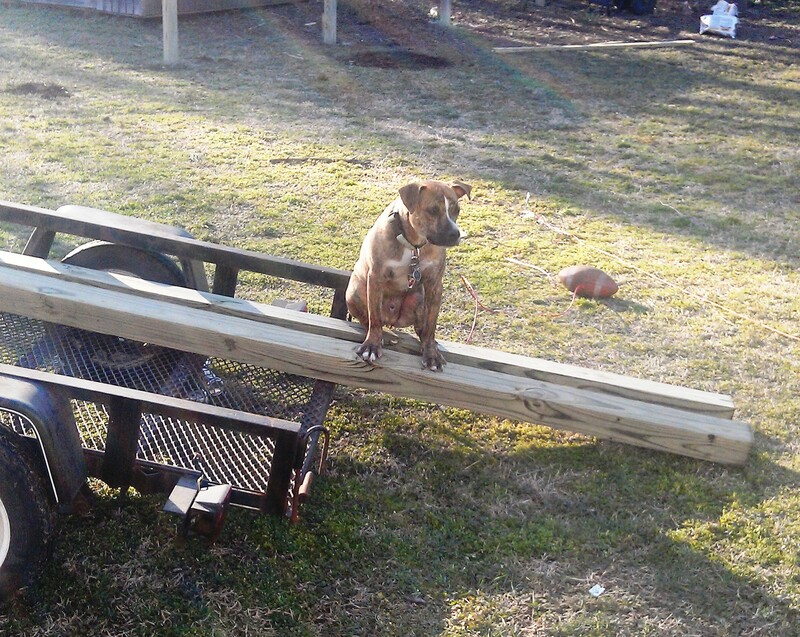 Part of the weekend that we left out of Coopers 48-hour report (just because that post was getting too dang long) was how he demonstrated some top notch construction supervisory skills. 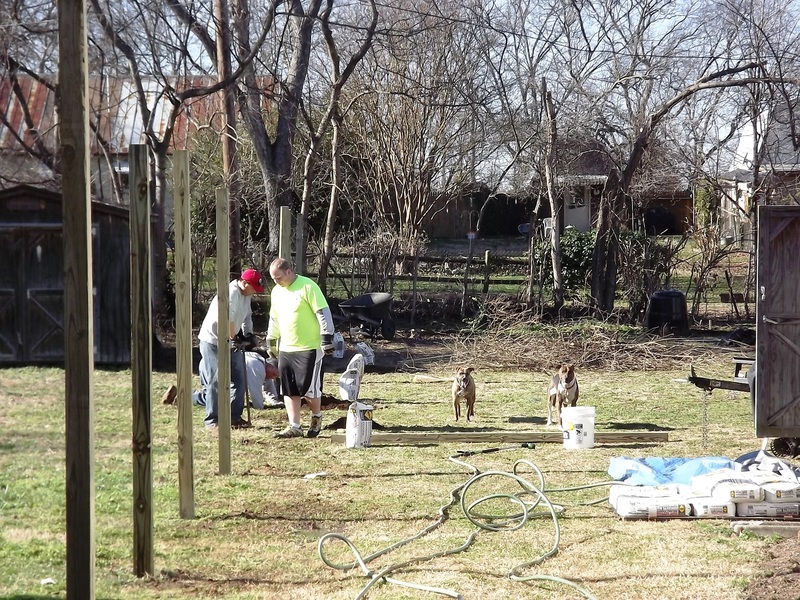 He accompanied us to our friends house to help them set the posts for their fence they’re building in their backyard. He did confess to me that his motives were not entirely pure – once the fence is built, he’s excited to have another yard to visit and run around in. As it is now, when we visit he and Oscar are stuck on the stupid tie-out. He cannot wait to be able to run free…he spent the afternoon taking his supervisory role very seriously, basking in the warm winter sun dreaming of the day he can romp and play with his foster brother and new friend, Libby. Cooper you are one interesting dude, and you have had a very interesting first few days with us. After meeting a few different dogs at The Shelter on Friday morning, Oscar selected you as our next houseguest. I think your compact size combined with your submissive nature sealed the deal for him. After we got you home, you spent the rest of the afternoon snoozing away on the couch with Oscar. I was thrilled – you two got along so well! 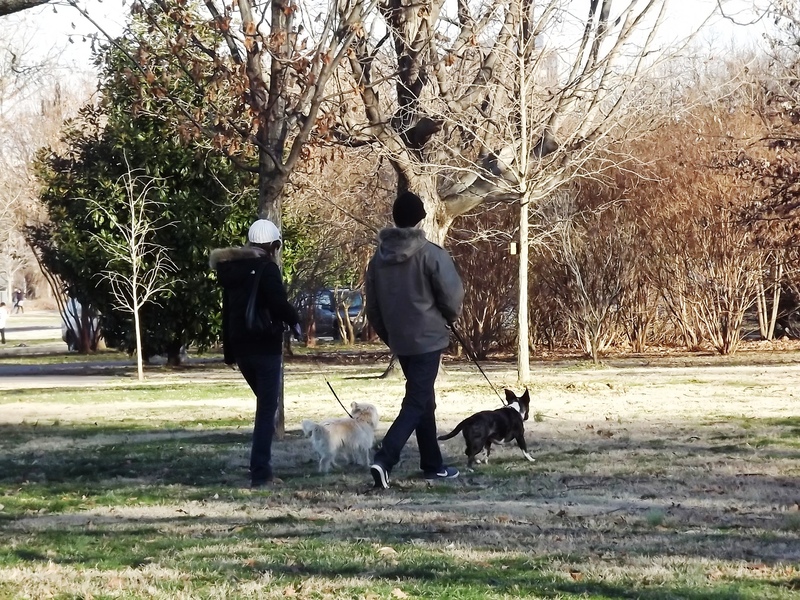 Then, when your polite leash skills allowed me to take you both on a walk at the same time by myself (something I had not yet been able to accomplish with any other foster dogs), I couldn’t believe my luck. 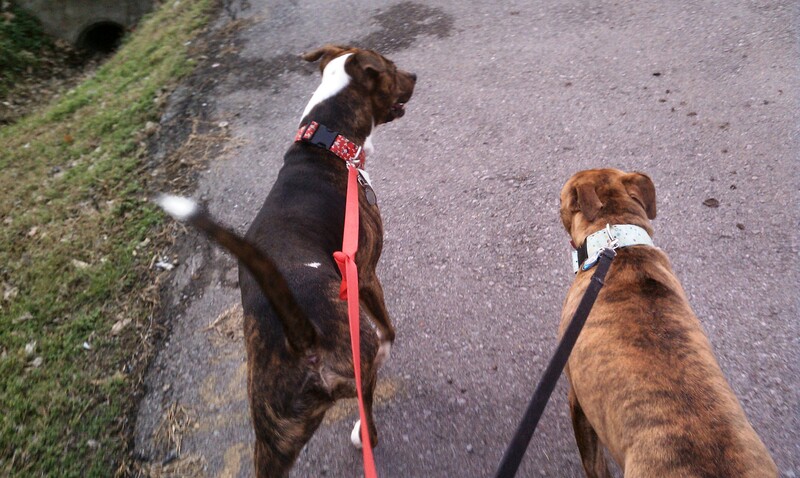 With Foster Dad’s hectic work and grad school schedule, it had been so tough in the past to make sure both dogs got plenty of walk time, but now I’d be able to walk two dogs at once! Woo-hoo! Foster Dad got home from work and fell in love with you instantly, just as I did. You reminded him of a certain previous guest of Foster House who he took a particular liking to, just a smaller size. He congratulated Oscar on a wonderful selection, and at the end of the evening we got ready for bed. 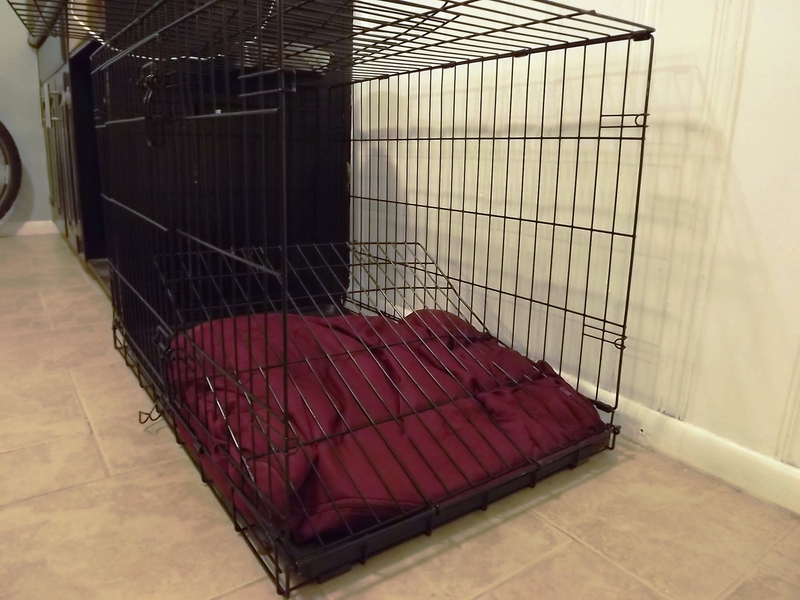 “Bed time” at Foster House means The Crate for foster dogs, so we set you up with a clean fluffy bed in a nice quiet corner of the kitchen. Since you had already eaten your dinner in The Crate and you didn’t seem too upset by it, we thought we wouldn’t have much of an issue. Well you showed us, didn’t you? You cried and cried, but Foster Dad and I were strong. We shut the door to our room and put pillows over our heads, determined to wait it out until your wore yourself out and settled off to sleep. Imagine our surprise when we woke up in the morning to find you on the couch! Seriously, how did you do that? 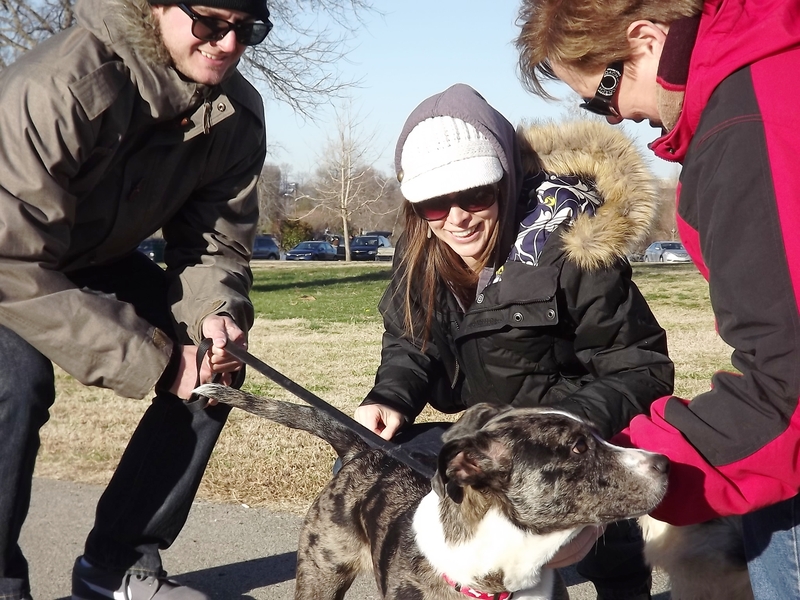 We didn’t have too much time to dwell on the specifics, you hadn’t destroyed anything or left us any messes to clean up, so we packed you up and headed out for your first public appearance – an adoption event at the local pet store. By the end of it you were exhausted. We brought you back home and poured you back into your crate, assuming you’d sleep off the afternoon. After all, we had some errands to run and a social engagement for Oscar, so off we went. By the time we got home…oh boy. Despite the destruction (including broken glass) and the few drops of blood on the floor, we were relieved to find that you weren’t hurt. 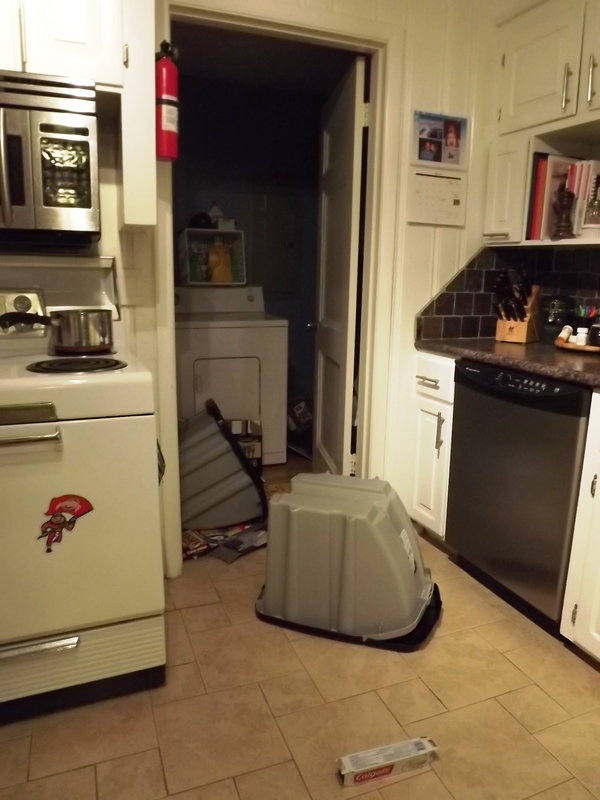 Sure, a few dishes were broken and we’ll need to replace some blinds, but stuff is just stuff – more than anything we were worried about you. What could have caused you to freak out so? Obviously, you are not a fan of The Crate – this much is clear. But even after you liberated yourself, you went berserk! You knocked over an entire container of dog food, yet you didn’t eat it. There was a full bag of treats and a chocolate brownie on the counter (which I know you were up on top of) yet you didn’t touch them. A big fluffy couch was right in front of you, yet you didn’t destroy it. And again – no number one or number two left on the floor! Hmmm. Our first thought: separation anxiety. After all, you were left all alone in a new place, you must have been scared and confused. So for that night, we tried what had worked in the past – we moved your Crate into our bedroom so you could be with the rest of your pack, and settled down to sleep. Well, Oscar, Foster Dad and I settled down to sleep…you, on the other hand – not so much. I think most professional dog trainers will tell you that the worst thing you can do for a dog who “complains” about being in a crate is to give in and let them out when they cry. However, I personally believe there is a difference between “Hey, I’m not ready for bed yet, I don’t like it in here!” and complete and utter distress. Cooper, my friend – You. Were. Distressed. And after witnessing what you had done when we got home that evening, seeing that even bleeding didn’t stop you from gnawing your way out of that metal crate, we knew you wouldn’t stop until you were free. And you know what? We’re not professional dog trainers. We’re just a foster family trying to do the best we can for dogs who need help. So at that moment, we made the decision that we thought was best for you – we let you out of your crate. Was it the “right” thing to do? Maybe, maybe not. Will we try to work with you in the future to get you to where you can stand being confined? Possibly. But for now, Cooper, in the interest of your own safety, congratulations – freedom. On Sunday we did a trial run before we had to leave you alone for a whole day of work on Monday. 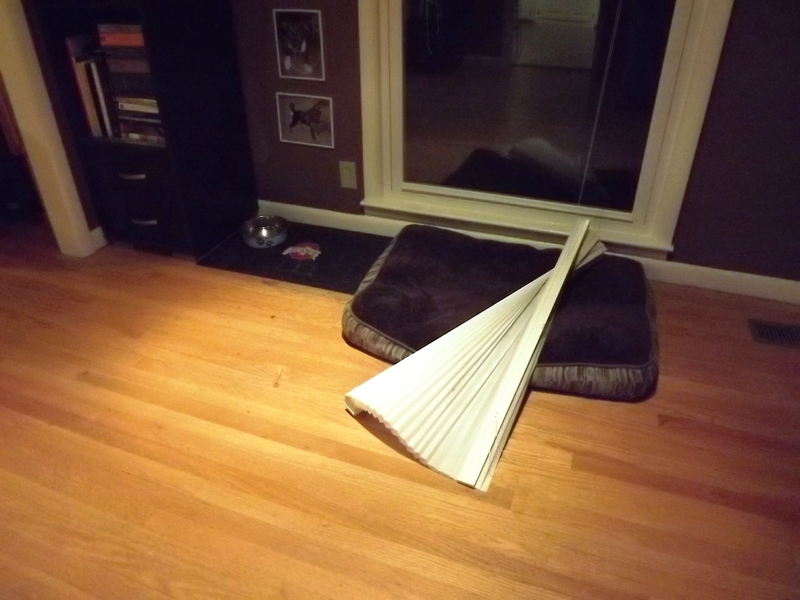 We puppy-proofed the living room as best we could, we raised the blinds so you could see out, and left Oscar with you as a calming influence while we went to the grocery store. Since you two seemed to get along so well, and Oscar is a pro at chillin’ on the couch while we’re out, we thought if you started to get nervous, perhaps Oscar could show you there was nothing to be worried about. We were gone for about an hour and a half and were thrilled to find zero destruction when we came home. So this morning we are trying the same thing. Luckily, I work so close to home that I can come home at lunch time to check on you guys to make sure everything is copacetic. Never a dull moment. Welcome to the foster family, Coop, and thank you for keeping us on our toes! 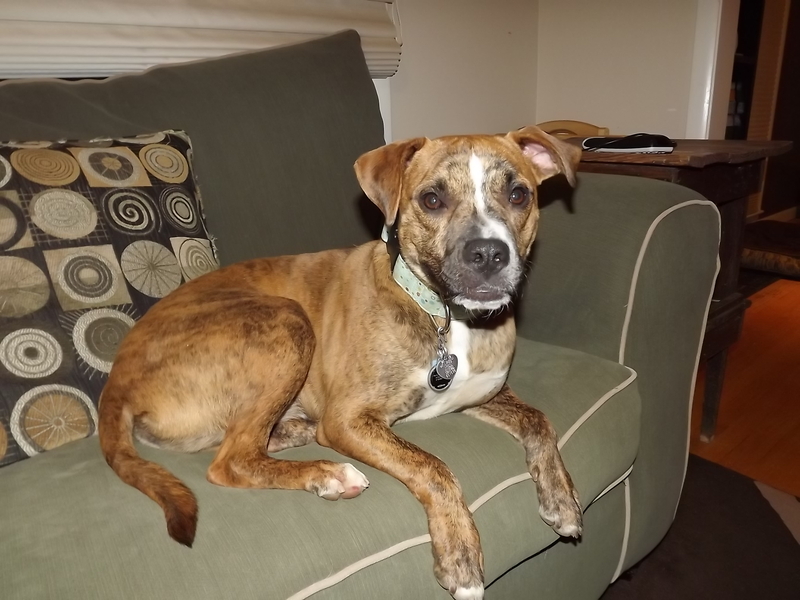 And the newest resident of Foster House is…..Cooper!! I tell ya, this guy’s got it all – the looks, the personality, the snuggle gene, the microchip…winning all around. He’s a compact little guy weighing in around 45 pounds who came into The Shelter as a stray with his sister a few months ago. 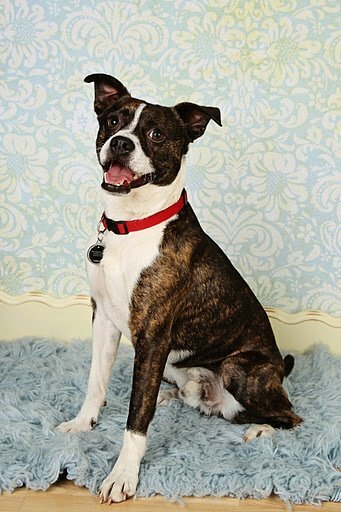 Like Molly Tamale, he has also been adopted out once before and returned because of a compulsion for feline chasing, so once again – Cooper will be adopted to a furever home without cats. 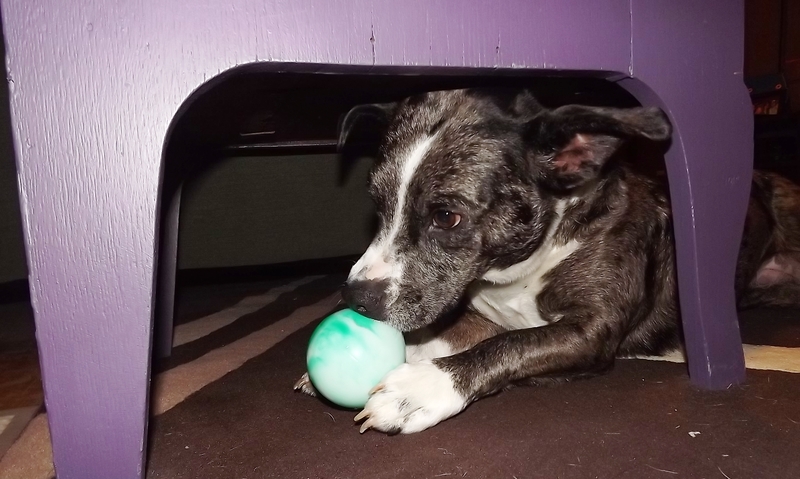 Other dogs, however, are a 100% green light – Cooper loves ’em. And frankly I’m a little disappointed in Oscar’s loyalty, because even though just last week he was mourning the loss of his soul mate, he and Coop already seem thick as thieves. So far we know that unlike our last house guests, Cooper is extremely food motivated. Already we can tell he’s exceptionally smart, so he should be a breeze to train. Also, his leash skills are superb. He’s only been with less than a day so he’s not yet perfect, but so far Oscar and I are very impressed. We can’t wait to spend the rest of the weekend getting to know Coop! He already has a jam packed social calendar too – stay tuned to hear all about his first adoption event, which we’ll be at tomorrow so he can make his début. Welcome to the foster family, Cooper! 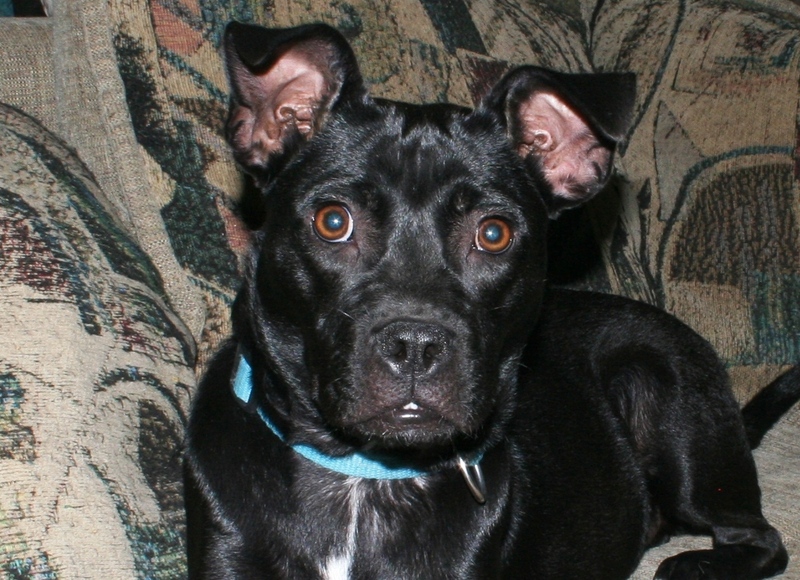 For more information on adopting Cooper, contact Agape Animal Rescue. I cannot even begin to express the importance of a strong support system if you decide you’d like to join the wonderful world of dog fostering. It’s an amazing experience, but anyone who tells you it isn’t tough is kidding you. Tough, yes – but so, so much easier if you have a strong network of people who you can lean on in various capacities. This should be a no brainer, but I’ll kick of with this one anyway – Before you decide to bring home a foster dog, it’s important essential that everyone in your household is on board. Having a dog is a lot of work, and if you already have furry member of the family (or several), adding another one – even a temporary one – is going to add to that work load. Feeding time, play time, walks, medications, picking up toys and other, well “stuff” – as a foster parent, you’ll be responsible for all of these things. Make sure everyone in the house realizes this, and is willing to help pitch in. I’m going to brag on Agape Animal Rescue here for a quick moment: They. Are. Awesome. You know all of those beautiful professional photos I am lucky enough to be able post on this blog? Agape is responsible for making those arrangements with amazing photographers like Harmony Designs Photography and Amiee Stubbs Photography. You remember how Oscar and one of our previous fosters got into a little spat? 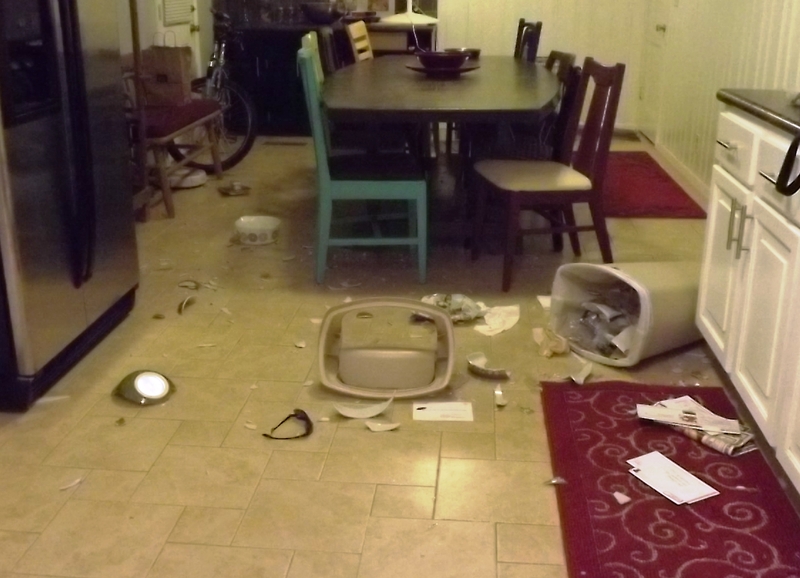 Well, we had no idea how to handle it, and Agape sent one of their resident dog training gurus right over to the house to help us mediate the situation. Oh, and remember how our first foster dog got adopted because his Furevers saw him at an adoption fair? We never would have been there in the first place if Agape wasn’t invited to participate in the event. 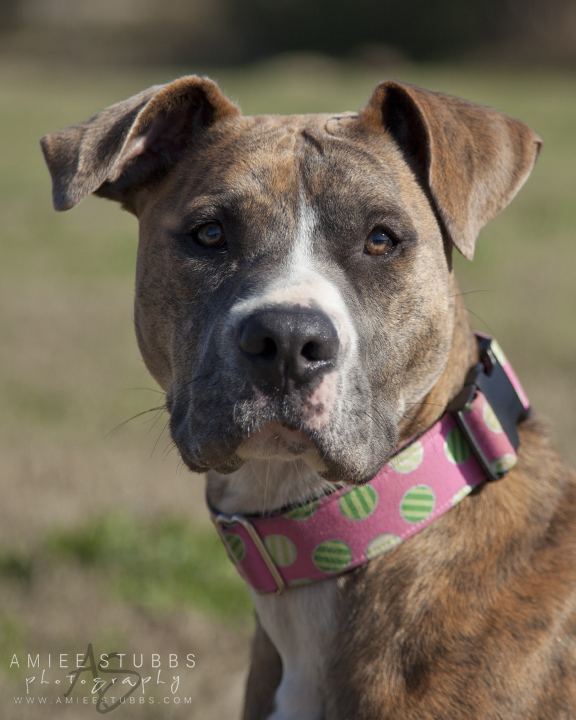 I could go on and on about the benefits of being associated with a reputable rescue organization if you decide you want to start fostering – support from your rescue organization is right up there with support from your family. Your rescue should be there for you in any way that you need – do they respond quickly if you call or e-mail? If you need supplies, are they able to get them to you efficiently? If you have an emergency, are they equipped to handle it? Also – do they value you as a foster parent? Do they take your needs and preferences into account, or do they try to “guilt” you into bringing a dog into your home that oh-my-gosh-is-going-to-get-put-to-sleep-if-we-can’t-find-a-foster-for-him-right-now? You don’t have to start your own blog to become part of the online rescue community. The blogosphere has no shortage of blogs for you to read with great information (check out my blog roll for some of my favorites, and don’t forget to peruse the comments, lot of useful stuff down there too! ), and many rescue groups have Facebook pages or Twitter feeds as well. 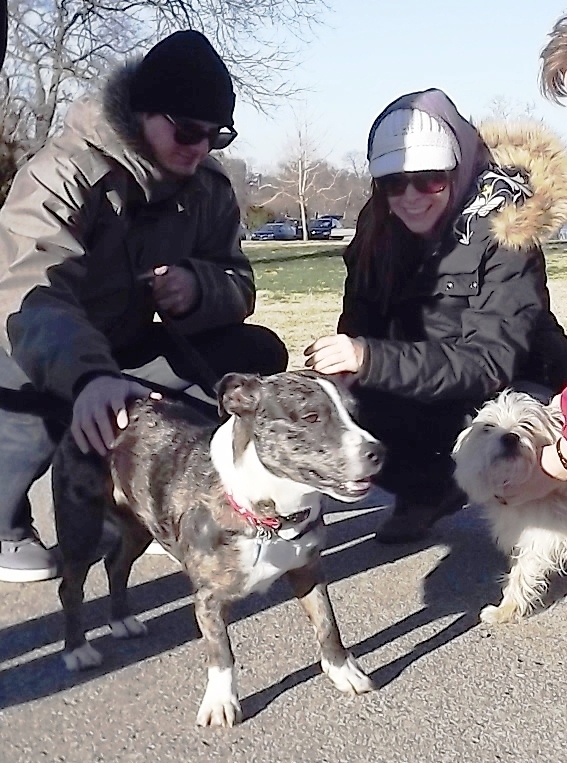 Some folks have even transitioned virtual friendships to actual real-life ones – check out the walking groups that Two Pitties in the City and Our Waldo Bungie have started! With a good support system in place, you’ll find that dog fostering is not nearly as overwhelming as it might seem. With the support and contacts I’ve made through the experience, personally I’ve found it to be a total blast! Molly Tamale may not ever realize how close she came to becoming our first Foster Failure. The attraction was instantaneous – we brought her home on a Thursday night, and by the end of the weekend Oscar, Foster Dad and I were all head over heels (paws?) in love with her. She’s just so dang cute, with those stubby little legs, floppy bat ears and goofy smile. Beyond that, Oscar seemed to be completely smitten with her from the beginning. Since Oscar’s approval will ultimately be the #1 factor in determining if/when we ever do add a dog to our family on a Furever basis, it was impossibly painful to imagine the day she might leave us. Molly settled right into our hearts so quickly and seemed so comfortable with us, that we thought the feeling must be mutual. But then one day, way too soon, we got The Call from our rescue: a family was interested in Molly Tamale and wanted to meet her. Even though I knew my response should have been, “Wow, that’s awesome!” I’m not going to lie – my initial gut reaction was, “What?!? Nooooo! I’m not ready!” I think my actual reply landed somewhere in between, something like, “Holy crap, is that some kind of record?” She had only been with us for 5 days at that point, I thought there was no way she’d be leaving us so soon! In the interest of full disclosure, I’ll admit that during the Meet & Greet, I was secretly hoping it wouldn’t work out. But then, something happened at The Tamale’s home visit. Maybe it was the way Caitlin’s eyes lit up when she saw Molly Tamale again. Maybe it was the way Molly crawled right into Dale’s lap as he sat on the floor, and showing him a happy tail and “love me” eyes like even Foster Dad or I had never seen from her before. Maybe it was the way Molly and Ziggy bonded instantly, and seemed truly Meant to Be. But I think more than any of those things, it was the way I could feel a teeny tiny piece of my heart breaking off, ready to give to Molly Tamale to take with her and keep forever. I realized then and there that Molly Tamale was never Ours to begin with. We were just a layover while she waited for her connection, so she could finally complete her journey. After six stops along the way, Molly is finally at lucky number seven: Home. So as I sit here typing, I’m not ashamed to admit I have to wipe away an occasional tear – I mean crap, this one was tough to say good-bye to. But I’m trying to remind myself that this is why we do this. Though I will always miss Molly, and I will love her forever, the tears I’m shedding now hold nothing in comparison to the pure joy I feel when I remember that she will never, ever be scared, lonely, cold, hurt, afraid, or rejected again. And the best part? There’s another dog out there right now, who needs our help. And we are going to help her. to see who else is looking for their People! 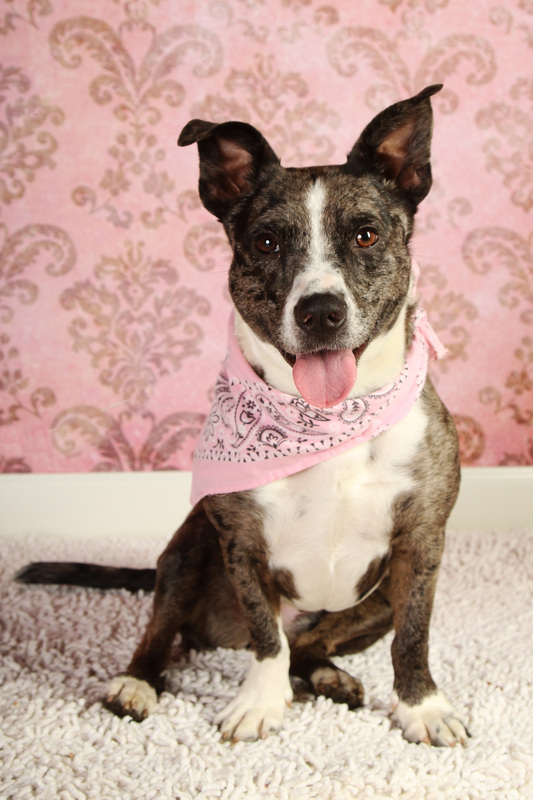 And stay tuned to meet our next adoptable house guest. I always love hearing the background events that lead up to how our wonderful adopters end up finding our amazing dogs. Caitlin sent me this beautiful story about how she, Dale & Ziggy came to add Molly Tamale to their family. Enjoy! Some three and a half years ago, I was a single woman about to take the giant leap of buying my first house. Having endured a seemingly endless procession of ill-matched roommates, I was determined to live alone once and for all. Well, almost alone. I needed a trusty sidekick, someone who had my back at all times and who would perk his ears to the predators of the night who might be stalking me. Yes, I needed a dog. 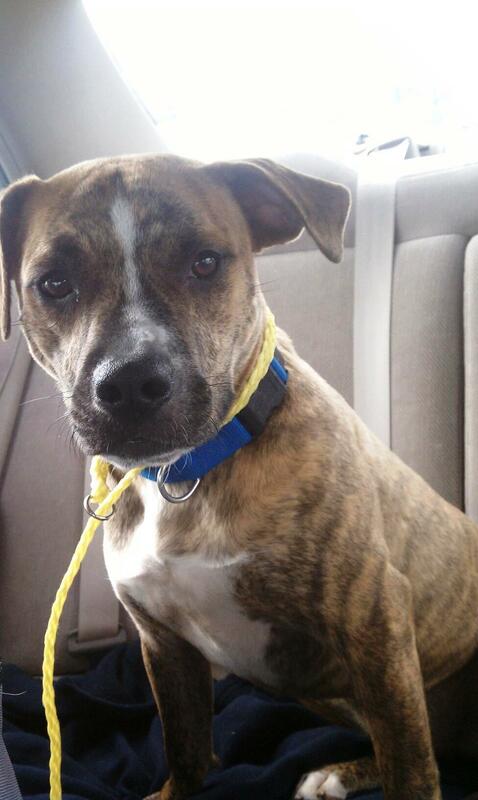 And so I googled and googled until I came across Agape pet rescue and found the man of my dreams, Ziggy. Together we lived for the next two years, when the economy tanked and so did my income. Sadly, we gave up the house and packed our bags and loaded up in the Prius across country, moving back to my home town of Sonoma. Ziggy had west coast adventures, including playing in the San Francisco bay on a dog beach full of kindred souls, hiking off leash with my friend’s dog in the mountains of Oregon, and being the hero of the local dog park when he stole the frou-frou poodle’s ball and teased that doggie’s mother with it until she huffed out of the park. But our west coast days left us feeling lonely, and we decided to take the sojourn back to Nashville to try our luck here once again. We were happy together, but as the years wore on, we yearned for a more complete family. Then we met Dale. Dale had puppy-dog eyes with an obvious crush on me he didn’t bother to hide. He followed me around with such sweetness, I couldn’t resist asking him after a night of cocktails, “Hey, you wanna be my boyfriend?” “Yes.” It didn’t take long until he was ready to meet Ziggy, and from that moment on, I was no longer Ziggy’s favorite, but a close second to the Daddy he always wanted and finally found. I understood, no offense, Ziggs; you needed a man in your life. Turns out, so did I. So the three of us spent the next year getting used to each other and becoming a family. 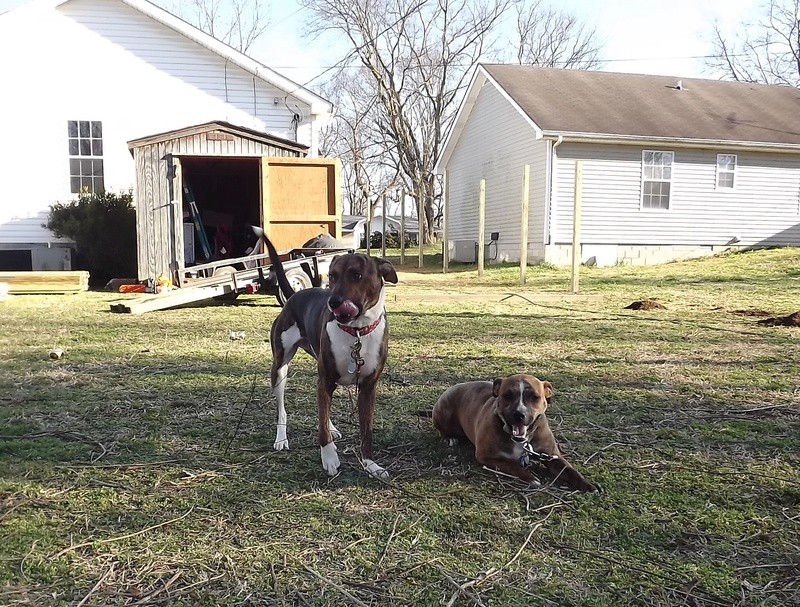 In December of 2011, Dale and I got it together and bought a house with a big back yard, fenced in. Ziggy needs his freedom, you see. As we prepared for the move, the question wasn’t whether we should get another dog, but what kind would make the most sense in our little family. Dale loves Ziggy, but wanted a dog that is a bit bigger and tougher looking. Ziggy is a bit new-wave with his crazy Mom-cut-my-hair again looks. We hit the internet in search of a baby, and when we found Molly Tamale, we knew we found the right dog for us. 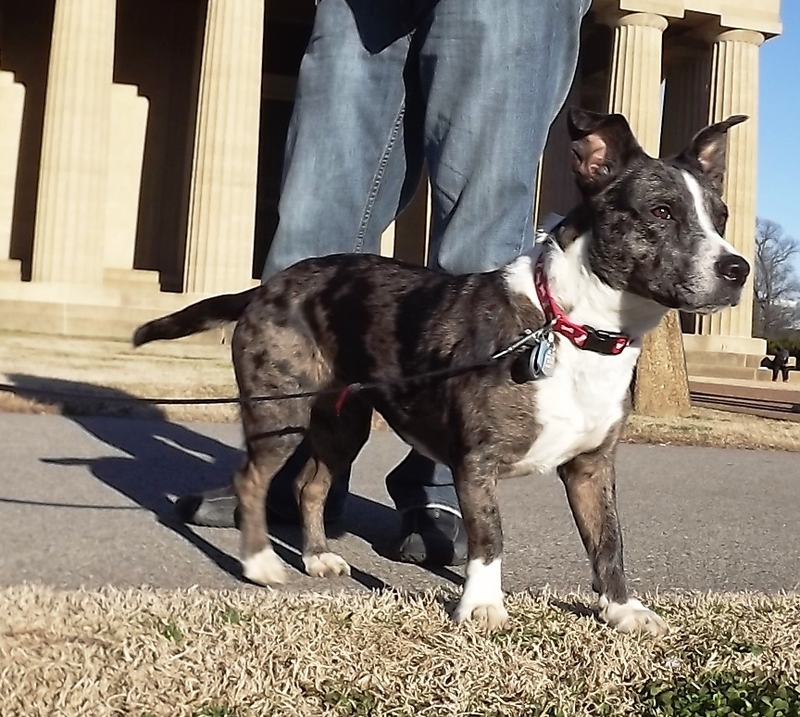 This was cemented upon meeting her in Centennial Park, where she pulled on the leash and won our hearts. Watching Molly in the park revealed how alert yet calm she is. She seemed to be on the constant look out, protecting her foster parents from any evil that might lurk in the shadows of the Parthenon. She also wants to chase squirrels, which is a very important trait. Ziggy was ecstatic to play with her, although she wasn’t really in the mood with so much protecting to do. 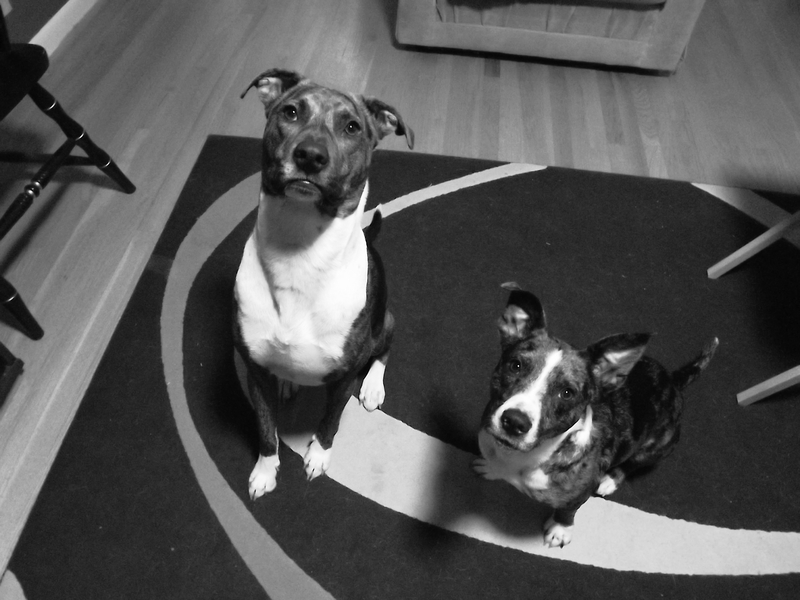 So she came to our house a few nights later, and after sniffing every inch and making sure there weren’t any bombs hidden in the corners, she was able to relax and play with Ziggy. There wasn’t a single growl or jealous whine. Then both dogs sat on Dale’s lap and declared him captain of the family. I could have felt jealous, but when you know those two little doggie souls were both abandoned to rescue care, you can only feel joy at seeing them bond to a human so intimately. I can accept my role as close second with no hard feelings. I kind of like Dale, too, so I understand. Now we’re waiting ONE MORE DAY before Molly Tamale comes home to us. Actually, we’re waiting 11 hours and 11 minutes as of this moment. Not that anyone’s counting! We’re so appreciative of all that Agape, Laura, Dave, and Pam have done to help us complete our family. Many pictures to come! It’s true! This morning we said adios to Senorita Tamale. By now she’s happily settled in at her new casa with her new familia…OK enough with what I remember from Spanish 101, the point is that Molly Tamale has found her Furevers! She’ll be livin’ the good life with her new People, Caitlin and Dale, and her new doggy brother, Ziggy, who (guess what?) just happens to be also be Agape foster program veteran! 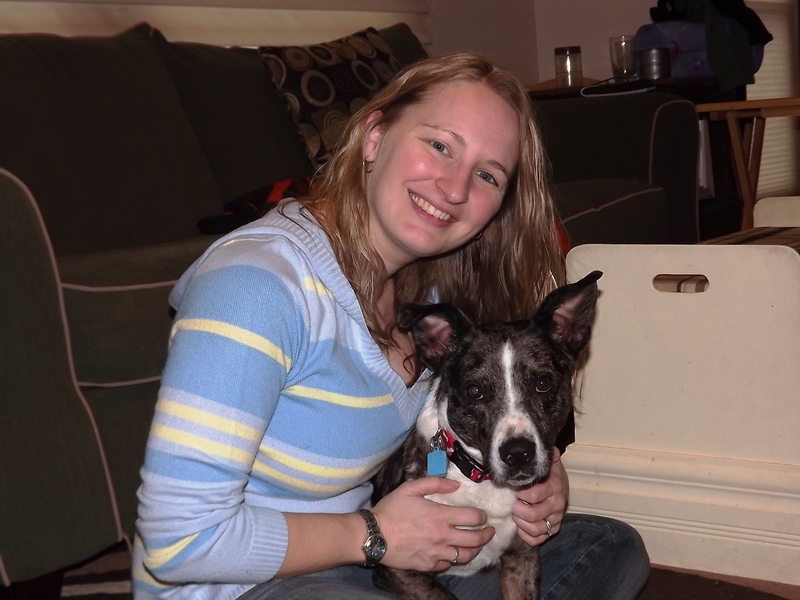 Caitlin adopted Ziggy two years ago, and after a stint on the West Coast she moved back to Nashville looking to add another furry member to their family. Naturally, she contacted Agape again, and – well, we’ll let her tell you the rest, check back tomorrow to hear Caitlin’s story of how she, Dale and Ziggy found Molly Tamale. So congratulations, our little Tamale! We’re going to absolutely miss the crap out of you, but we are over the moon that your wandering days are finally behind you. 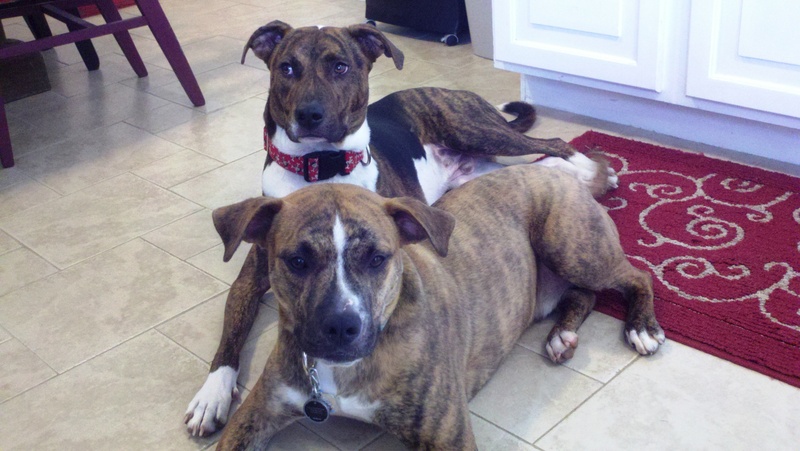 Caitlin and Dale are amazing dog owners, and they are going to give you the warm, loving, happy home that you deserve. I just hope you’ll be able to keep up with Ziggy!